A nice crowd (was that 10 people?) participated in Sunday’s workshop on ketchup, mustard, and salad dressing. Even though Kraft and Heinz would like you to think these things are something only they can make, about half our folks had made at least one of these items before at home. It made me thankful, yet again, that we still have some traditions to preserve, and we aren’t starting entirely from scratch! Download the workshop’s condiment recipes here. Ketchup basics: Ketchup is made from concentrated tomatoes (simmered-down puree or even tomato paste) and seasoned with vinegar, salt, sugar, and a somewhat surprising blend of spices: cinnamon, allspice, cloves, cayenne, and sometimes onion and garlic. Two recipes are included in the downloadable recipe packet. Mustard basics: The type of mustard seed you use really matters! Don’t use all brown or black mustard seeds; use some yellow ones as well. The darker mustard seeds have a more bitter flavor and can be overwhelming if used alone. Dried mustard powder can be used alone or with whole mustard seeds, depending on the kind of mustard you want to make. If using whole seeds, soak them overnight in water and vinegar so they’ll crack open when you put them in the blender the next day. Mustard changes flavor a lot over time. The first day you mix it up, it might be too strong (hot and/or musky) to eat right away. Let it mellow a week or more in the fridge, and it’ll probably taste much better. An exception to this is mustard made from mustard powder and water or vinegar. If you want nose-searingly hot mustard, make it just before serving and don’t bother saving the leftovers. Like wasabi, it’ll singe your nose hairs but lose potency over time. Salad dressing basics: Salad dressing is usually a variation on oil + vinegar + spice. Since oil and water don’t mix, you either need to constantly re-mix it, or find some kind of emulsifier (a substance that binds the water and oil together). 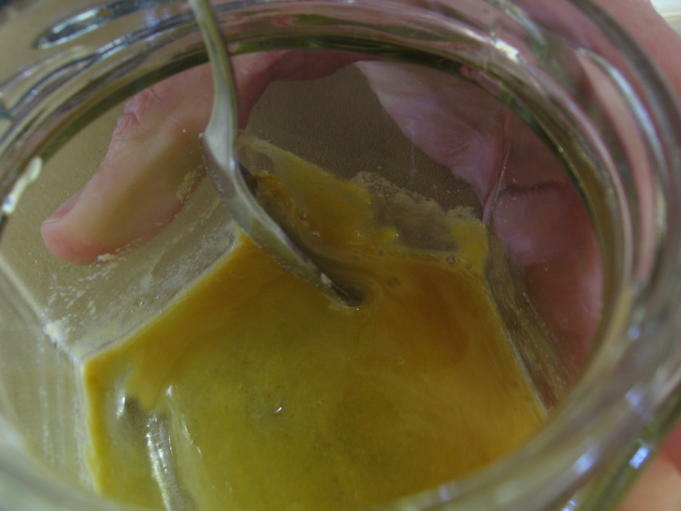 Xanthan gum is commonly used to emulsify commercial salad dressing; we also discussed whether prepared mustard can help salad dressing stay emulsified. A standard vinaigrette traditionally has two parts oil to one part vinegar – but you’ll want to use a tasty oil (like a good olive oil) for this. Participants also have made good dressings with 3:1 or 1:1 oil and vinegar. It depends on what you like, and how good your oil tastes. Classic French dressing is just a vinaigrette with paprika. The simple Honey French dressing in the recipe packet has equal parts oil, vinegar, and honey with some paprika and salt. The honey thickens it enough to be distinct from a vinaigrette, but it’s not so “ketchup-y” tasting as other “French” dressing recipes. Folks made their own salad dressing and mustard concoctions at the end of class. some of them needed extra ingredients, or time to let the flavors blend. Folks, report back here with your results! I’ll re-post the recipes when they come in. Last Sunday, we learned how easy it is to make homemade sauerkraut. I forgot my camera (again…) but the inimitable Ilex over at Homesteading in a Condo recently posted a photo essay of how she makes kraut. I refer you to her excellent guide to making sauerkraut, and make a few notes here about how we varied the process slightly. 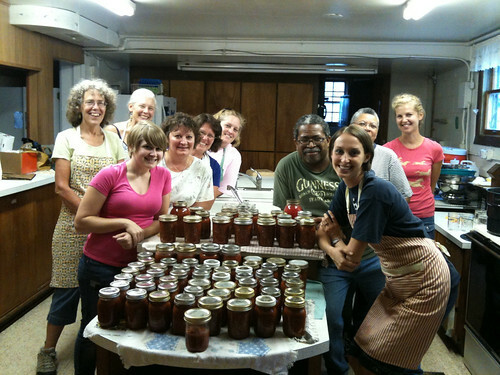 Holly has beautiful, vintage sauerkraut crocks, and she makes several gallons at a time. If you are not blessed with such crocks, or want to make smaller batches, all is not lost! 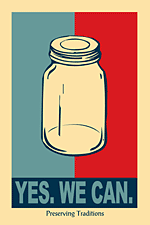 Canning jars make excellent small-batch kraut containers – use either quarts or half-gallon wide-mouth jars. You can either salt the shredded cabbage in a bowl, tossing thoroughly to mix, or layer cabbage and salt right in your crock or jar. In either case, every few inches you need to stomp the cabbage and thoroughly bruise it. This gets it to release its juice, which will combine with the salt to make the salt brine that preserves the cabbage. Shred, salt, stomp. Shred, salt, stomp. That’s about all there is to it. When you get to the top of your container or run out of cabbage, you want to make sure the kraut is submerged under brine. In a canning jar, I get great results by tucking a whole cabbage leaf into the jar, tucking it down around the shredded cabbage, to make a “stopper.” Then I put a quart-sized freezer bag into the neck of the jar and fill the bag with brine (2T salt to 1 quart water). Make sure the bag fills every crevice and holds the cabbage under the brine, and top with a loosely-sealed plastic lid. A 3-4 pound cabbage makes about a quart of kraut. Use a total of 1.5 to 2 tablespoons of salt per quart of kraut. Measure it out beforehand and sprinkle it in evenly as you go. More salt preserves better; less salt tastes better. As long as you keep the cabbage submerged and the top on (but not tight), you can usually keep the kraut from getting moldy. Mold or “scum” (usually kahm yeast) is not dangerous, but it doesn’t taste good. You can safely scrape it off (taking a layer of kraut with it, if the gunk isn’t free-floating) and the rest of the kraut is OK to eat. Crumble and brown sausage with a diced onion. Add shredded cabbage and kale, a diced tart apple, and cooked diced potatoes (boil them with a lot of salt!). At the last minute, stir in about a cup of kraut and just heat it through. Top with cheddar, if you’re feeling decadent. Add well-drained kraut to potato pancakes. Mix 1/4 c. kraut or pickle juice, 1/4 c. vinegar, 1/4 c. salad oil, and 1 Tbl prepared mustard. Mix together and use as salad or slaw dressing.